The North West Premiership season may be just two weekends old, but Saturday’s thrilling win for Brigade over reigning champions Strabane may have major ramifications for the remainder of the season. After losing their opening-day match to an understrength Donemana, a second successive defeat for Brigade at Strabane Park would have been disastrous. Instonians showed in last season’s NCU Premier League that you can lose your opening two matches and still win a title, but it’s an almighty difficult task, especially in a league as unpredictable as this one. But if Brigade’s ambitions remain very much intact, Strabane’s championship defence, after a winter of defections that saw their title-winning team decimated, has gotten off to the worst possible start. They were controversially beaten on the opening day by Ardmore and Saturday’s four-wicket defeat will hurt almost as much with one of those winter defectors, Johnny Robinson, the key architect of their demise. Tommy Barr’s team were heavy underdogs but looked on course to pull off an unexpected win when they reduced Brigade to 71 for six in pursuit of their 159 all out. Mark Snodgrass, the seam bowler who at one stage over the winter seemed certain to join the exodus from Strabane, ran through the top order of his former club, taking five for 20 in a brilliant burst. 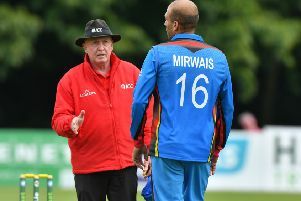 He removed Ryan Hunter and Iftikhar Hussain for ducks in his first over as the visitors lost their first two wickets without a run on the board. Brigade captain Gareth McKeegan (10) and Ian McGregor (21) followed, both to catches by Barry Scott. David Murdock briefly rallied with 16 before falling to Barr but at 71 for six, there seemed to be no way back for Brigade. Robinson though, in partnership with Andy Britton, a highly effective number eight, had other ideas, and with Snodgrass bowled out, Strabane lacked the back-up bowling to break through what became an undefeated 92-run stand for the eighth wicket. Robinson was very much the senior partner, striking eight fours and a six in an unbeaten 72 from just 84 balls while Britton’s 31 not out contained two boundaries. Brigade got home in the 43rd over. Earlier in the day Strabane were indebted to some late-order hitting themselves as Aaron McDermott and Barr rescued them from the perils of 90 for eight with a 62-run stand for the ninth wicket. McDermott struck an unbeaten 37 from 41 balls and Barr 25 after the evergreen Mark Simpson had ripped apart the Strabane middle order. Peter Gillespie was trapped lbw for a duck and Simpson (4-20) also claimed the key scalps of Ryan Gallagher and professional Tawanda Mupariwa. Britton and Robinson also shared four wickets and Hussain was miserly, conceding just 17 runs in 10 overs. Aaron Gillespie (27), along with McDermott and Barr, was one of just three batsmen to pass 20. St Johnston’s game with Donemana was the only match not to beat the weather.